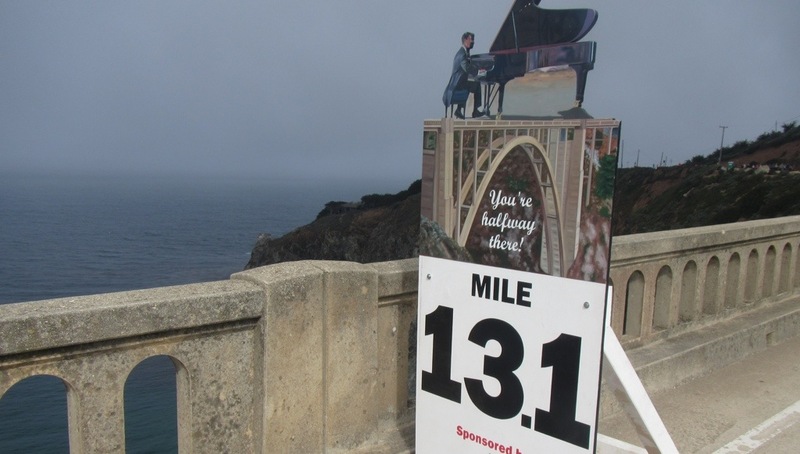 If the Big Sur International Marathon is not on your bucket list, then add it now. It’s kinda weird that I don’t have a bucket list (especially since I have a list for virtually everything else in my life). 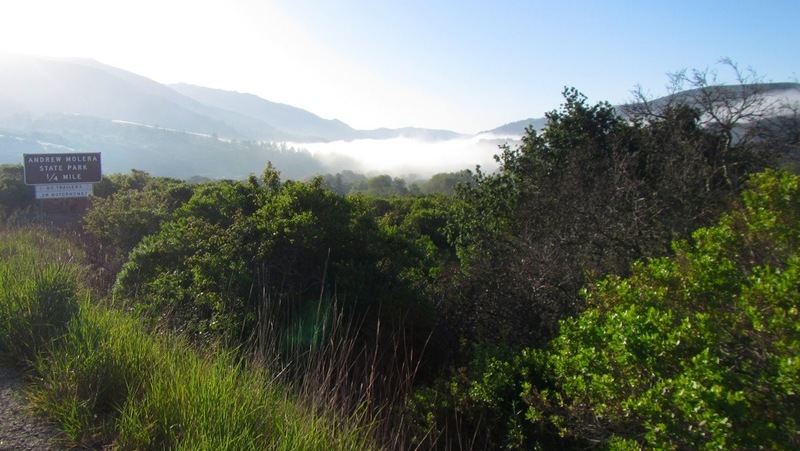 If you don’t have a bucket list, then start one now by putting “Run the Big Sur Marathon” at the top of the page! 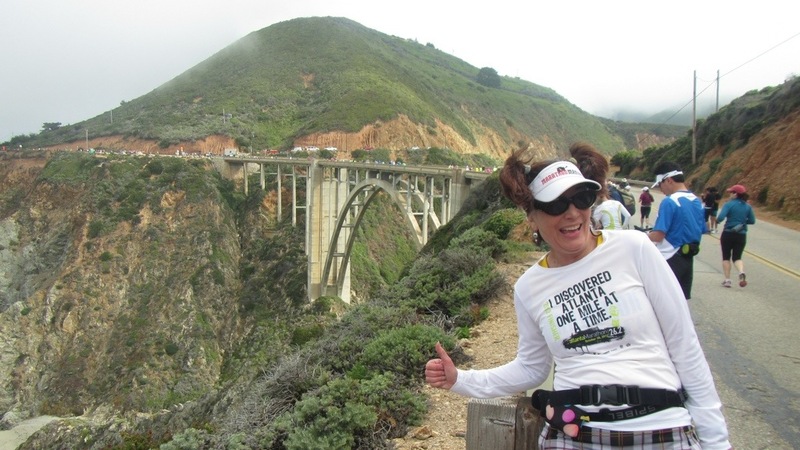 My Big Sur Marathon weekend started Saturday with a fabulous family fun run in Monterey. It was there that I formulated my plan to run with camera in hand and no watch. I also decided that I wanted to run at least part of the course with my Mom’s cousin Claire. 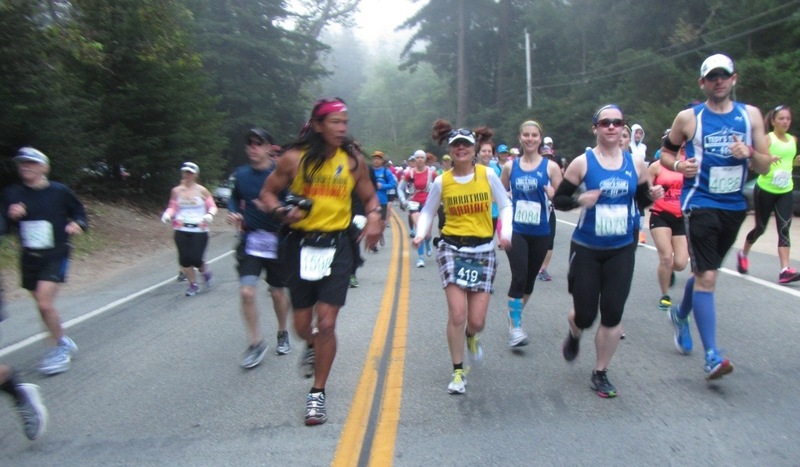 This race report is divided into three chronological sections: first the photographic part (read the captions), then the running part, and finally the finish. It was an early (4am!) bus ride to the start, which left us plenty of time to wait in the porta-potty line. Twice. I was relieved to find plenty of other runners carrying hydration packs. 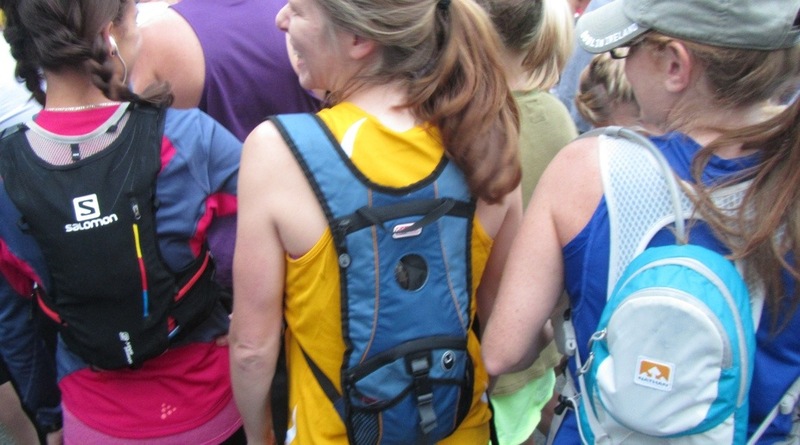 I’m always self-concious carrying my hydration pack to a road race. Running with Claire is pretty fun. 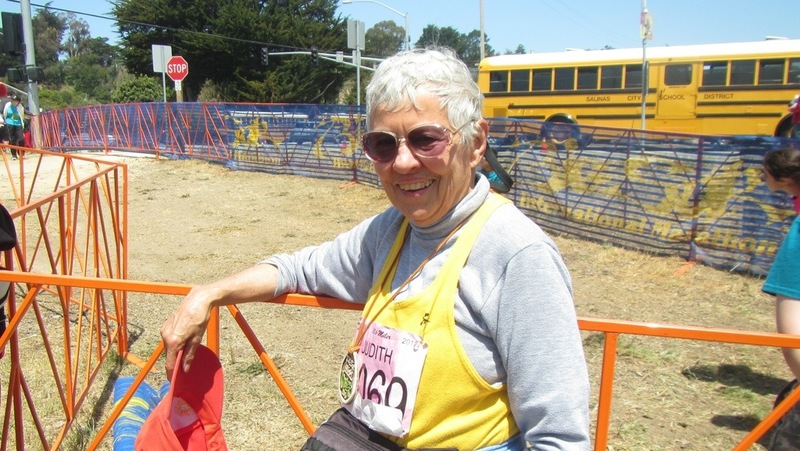 As an active Marathon Maniac, she has no shortage of friends on the course. Here she visits with Giovanni, who carried a digital SLR camera for the entire run. 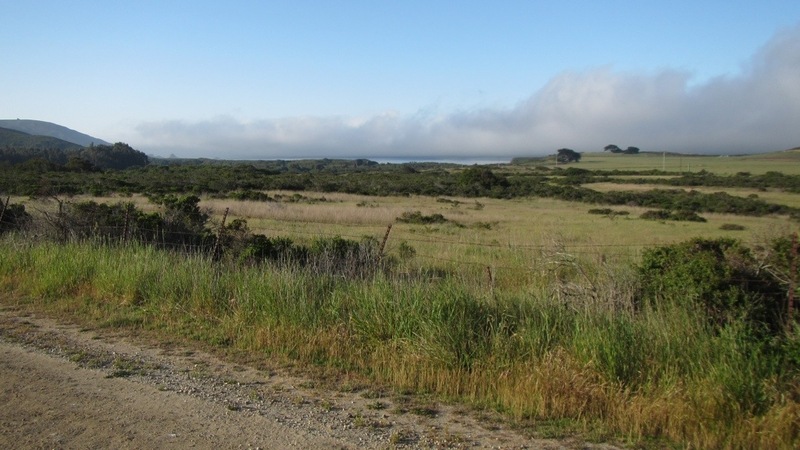 The fog burned off before Andrew Molera State park around mile 5. And we were treated to the first peak of miles and miles of Pacific Ocean views. 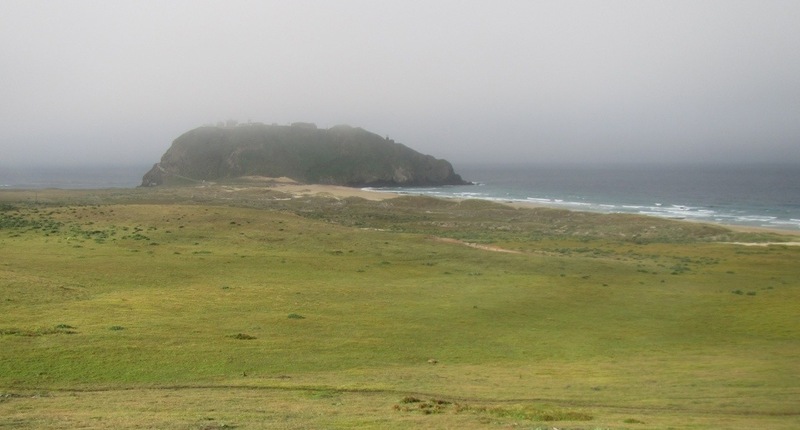 Point Sur State Historic Park was mystical – my small camera could not do it justice. 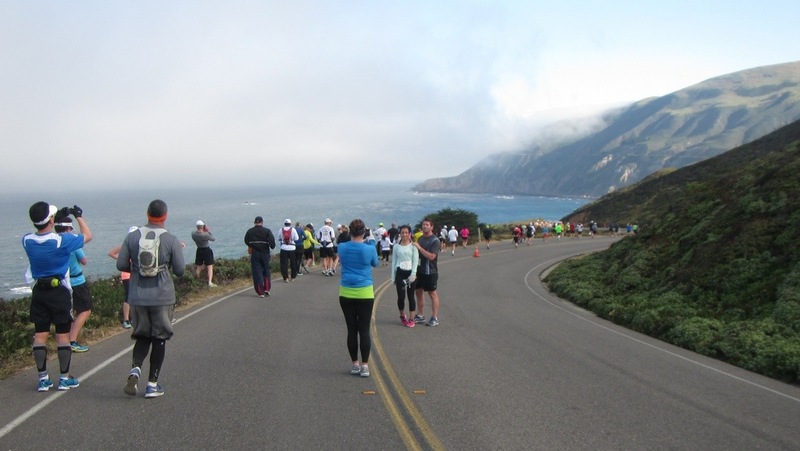 Everybody stopped to capture the spectacular view of Hurricane Point, the climb that starts at mile 10. Looks more like a guided tourist hike than a marathon! I pose with Claire and her signature “thumbs up.” Marathon Maniac Halbert took the photo – more on him later. 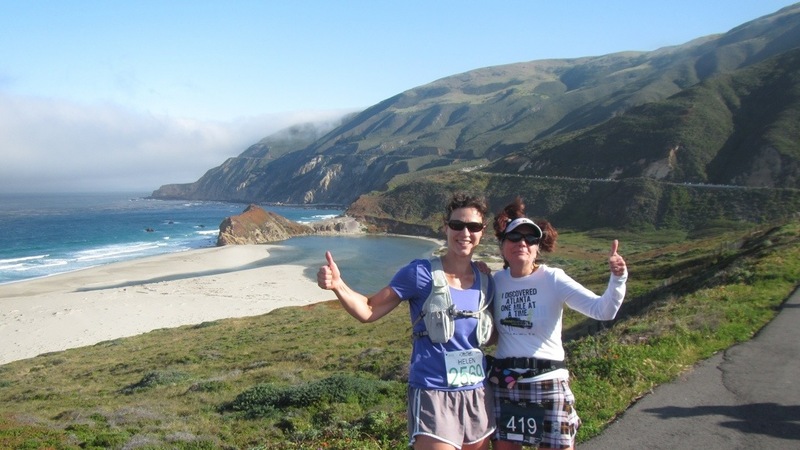 Notice Claire’s dark bib designating her as a “Boston to Big Sur” runner. 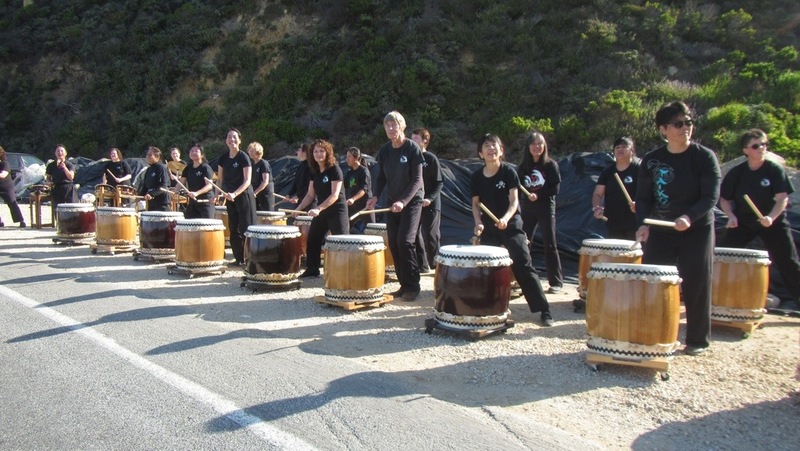 Taiko Drummers at the base of the Hurricane Point climb are just one of the many live musical performances along the route. 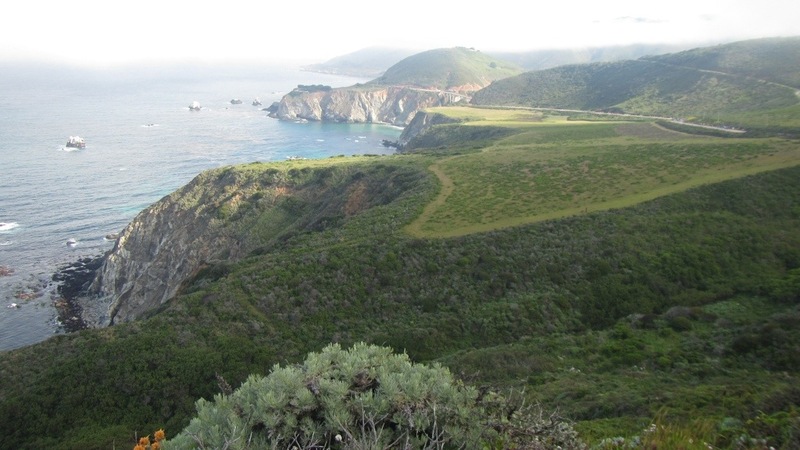 The views along the 2-mile, 560-foot climb up Hurricane Point were spectacular. 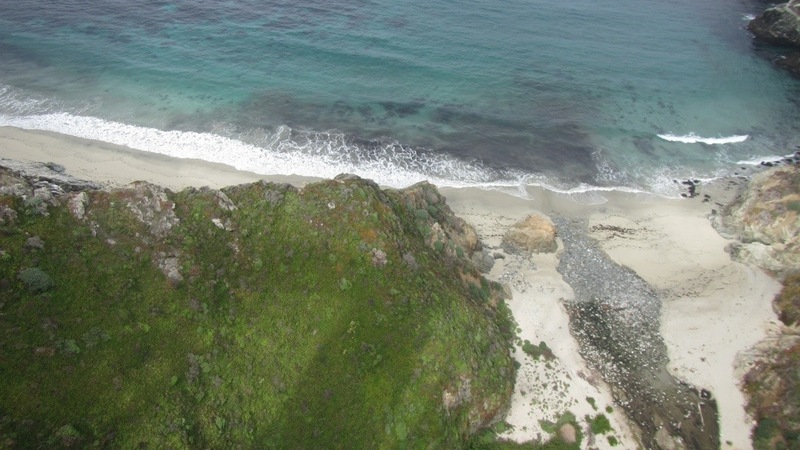 Our first glimpse of the gentle descent from Hurricane Point to Historic Bixby Bridge (1932) in the distance. Claire before Bixby Bridge, where we could already hear the amplified live grand piano music wafting over the bridge. 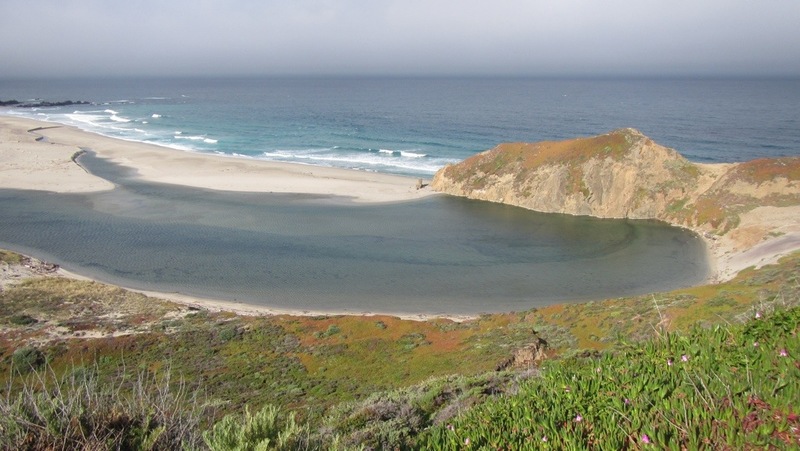 View over the edge of Bixby Bridge. To say that we lingered to enjoy the sights and sounds at the bridge would be a huge understatement. The half-way mark is cleverly positioned right in the middle of the bridge. I felt great and was getting antsy to pick up the pace, partly thanks to the caffienated GU that I took at the 12.2-mile aid station. I crossed the half-marathon timing mat at about 2:40 – a pace of 12:12 minutes/mile. I was thinking it might be time for me to cruise on without Claire… lovely as it was, I didn’t want to be out on the course for more than 5 hours. I put my camera away while I waited a minute or two for a quick porta-potty stop. I said goodbye to Claire and off I went. I couldn’t have planned the day better if I had tried! The second half is not nearly as scenic as the first, although there were a few times where I was tempted to pull out my camera again… sheep, cows, and a quaint barn. It was a bit surreal running a huge negative split. I ran the second half in about 1:55, somewhere in the neighborhood of a 9 minute/mile pace. The second half has no big climbs, but plenty of rollers that can really wear on a tired marathoner. I felt like a stinker (at best) or a cheat (at worst) passing all these hard-working, but tired, runners with my legs fresh as daisies. I entertained myself by observing all the different running outfits, and I had already noticed a whole lot of Lululemon appareal out on the course. At some point I decided that I would count all the Lululemon insignias that I passed, but then there suddenly seemed to be none at all. I was only able to find 5 or 6 before I gave up the count. At another point the police escorted a traffic caravan in the lane opposite us. The vehicles contained either enthusiastic supporters or annoyed and delayed motorists. It was fun to smile and wave at them all – to see if I could get a smile out of some of those grumps! The last mile I could really feel the air temperature increasing. The weather had been unusally lovely for the event, with only a mild-to-moderate head wind and clear sky for at least the most scenic parts of the course. I felt for those still on the course with the temps increasing for their final cumbersome miles. I passed a couple of guys as we neared the finish chute. There was a gal in front of me as we entered the chute, and I gave her an encouraging word, “Bring it home! I’m certainly not going to pass you in the chute!” I throttled back so she could finish first, and she gave me a sincere thanks afterwards. 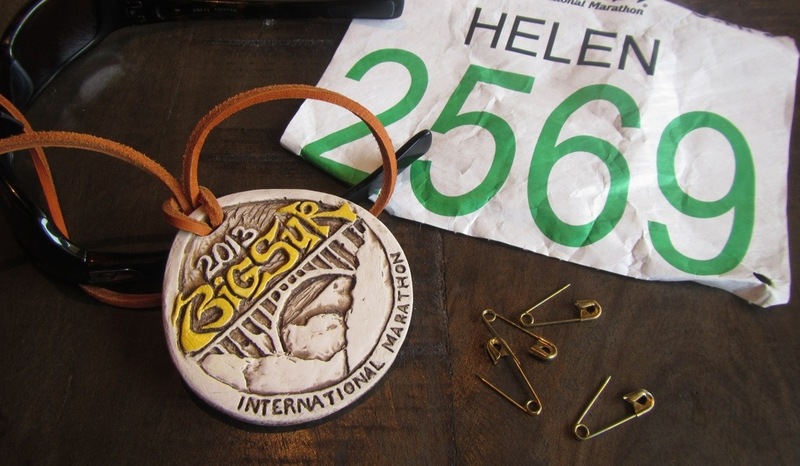 Mementos of the day: A unique clay finisher’s medal and personalized race bib. 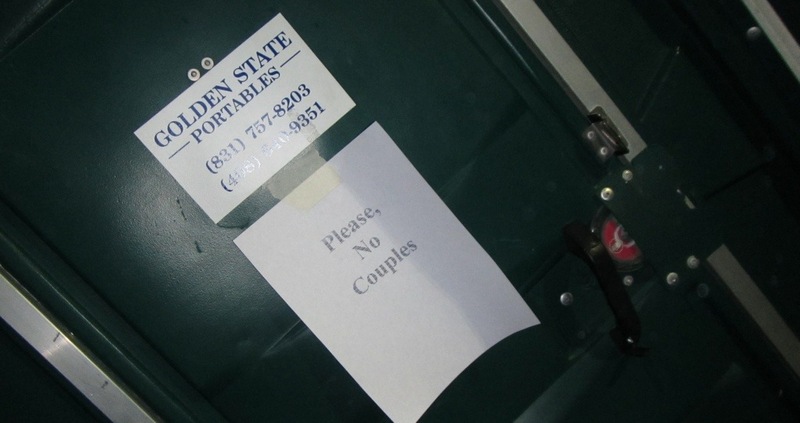 The well-used golden safety pins are my own touch. 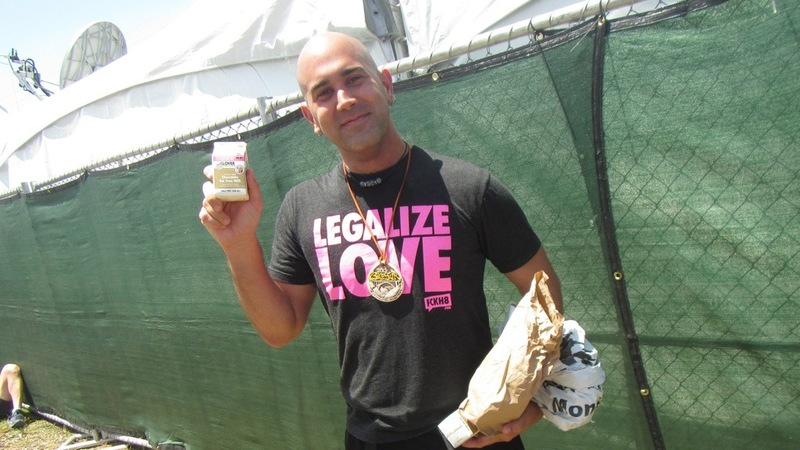 And this is Halbert, the Marathon Maniac who took our picture back before the Bixby Bridge. I told him that I had looked all over for the chocolate milk since I could have sworn that I read there would be some at the finish. I guessed that I was getting this one confused with the SF Marathon in June. He quietly disappeared, and a couple of minutes later re-appeared with chocolate milk! What a gentleman! Congratualtions! You have completed a marathon of a race report! Spectacular vistas, great company, and good luck with the weather definitely put Sunday’s run in my top 5 favorite running days to date. Nice job, Helen. Well written, and made me want to run this marathon!!! Currently counting baby kicks, but next year, game on!! K – Thanks for the note. Can’t wait to run with you and the little stinker again! Another good read Helen . Good job. How fun, that is what marathons need to be, FUN! Love your reports.